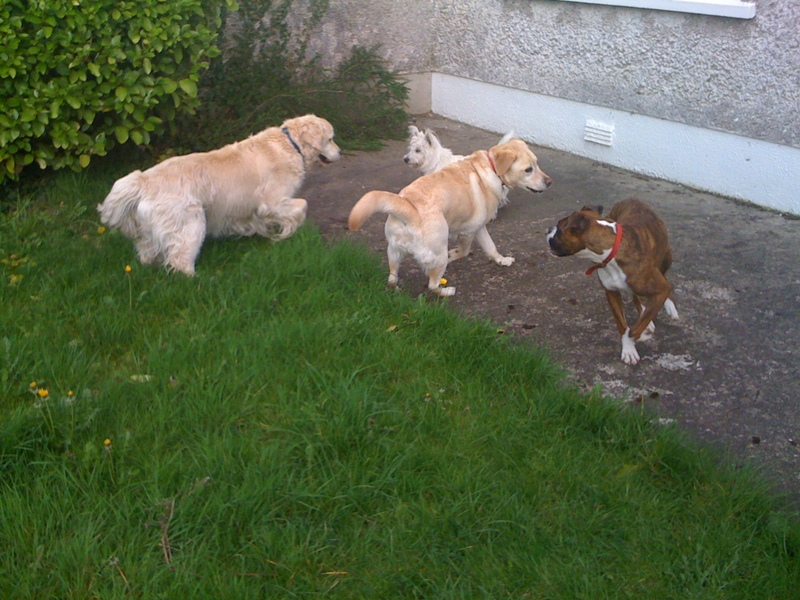 We finally got around to getting all four family dogs together up at Carol’s House…. Jeff is the Grand Old Retriever, trying to keep up without overdoing it. He’s Carol’s family dog, though as Mom always reminds us, she fed him with an eye dropper every two hours for the first two days of his life! He’s heading towards 14 now, which is a big age for such a large dog, but with good veterinary care he’s pootling along. 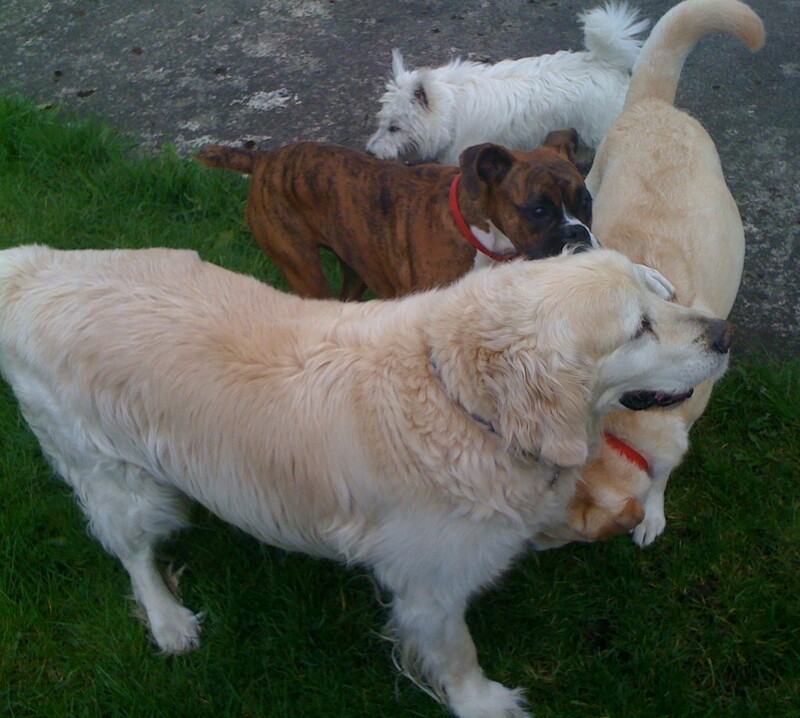 Everyone knows my Willow – full of fun and hair and supremely confident. She loves playing with Bo, but Lola is a bit too high every for her at times. But we’re mad about her, and Mom and Dad get great pleasure out of her company too. Next is Lola, Ronan’s brindle boxer. I don’t know her too well yet but she’s extremely lively and very affectionate. And the three boys are cracked about her. I haven’t heard how Helen has taken to her yet, but I’m sure she’ll win her over. She’s about 9 months old now I think. And finally Bo, the dog who is a cow, though he’s more often called Bobo (as in the clown). he’s a West Highland terrier and about six months old now. He’s an absolute sweetie, loves to lick ears, and there’s a certain convenience in having a dog that you can pick up bodily and place where you want it to be! So anyway, these pics aren’t great because Ronan just took them with his iPhone, but I have a new digital video camera on the way, and I’ll post something better when I get that up and running. ~ by Lynn Duffy on May 3, 2010.